You can backup, restore, freeze (with Pro) your apps + data + Market links. This includes all protected apps & system apps, plus external data on your SD card. You can do 0-click batch & scheduled backups. 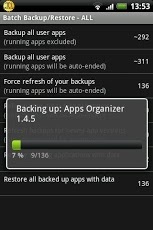 Backups will operate without closing any apps (with Pro). You can move any app (or app data) to/from the SD card. You can browse any app's data and even query the Market to see detailed information about the app. • This is a minor release. Have a look at the changes in 5.8.0 too! • [PRO] Improved XML backup/restore of SMS/MMS: fully supports messages/conversations with multiple recipients. • Improved stability of USB MTP helper code.